Are there no beggars at your gate. Nor any poor about your lands? And let your selfish sorrow go. Missionary work among the Indians of Canada. The-Man-on-the-band-stand, who is NOT an Indian. Price: - 10 cents a year. little paper, and for your many kindly words. sorry to learn recently lost her little daughter. McIntosh of the same place are in good health. the boys lost a foot each, and one boy lost two. doing for the Indian youth. evenings a week, at drill or in basket ball. peal of collision. It is just so, all through. have been glad to have taken him to Lock Haven. that Kennedy is a good solicitor; that Mr. Always on top - the roof. Professor Kinnear has a wheel. Bad teeth mean poor digestion. Empty wagons make most noise. Ten inches of water in the boiler-house. Firmly closed lips indicate determination. An open mouth is an indication of stupidity. instead of forty years old. master tailor for the present. marching, at the band sociable. are always before its face. concert, which we expect to enjoy in full. 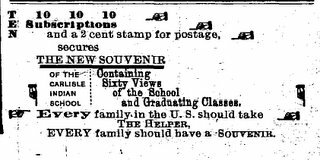 accompany the subscriptions to pay postage. jollity, faithful work and excellent ability. death resulting from the bad air. Why SHOULD "i" be the happiest of all vowels? say until after the 22nd, which is right or not. so many people to their graves - pneumonia. look them in the face. neighbor and become absorbed in with them. don't let us go back. "All our old associations call us back. a hand in educating you." from the school strong in the Christian faith. better than the bad white man. "An Indian hunter once got lost in the woods,"
girls of so many tribes before him. and girl like to hear. pupils at breakfast, very earnestly and sensibly. OF THE GIRLS OF THE TRIBE. Being Bought and Sold Like a Horse or Cow. the school to marry her. Every thing seemed all straight and right. Agent knew not but the girl loved the man. minister to take the marriage vows. that she had been bought. his words are bearing fruit. I am composed of 19 letters. My 1, 3, 8, 17, 5 is a supposed right. My 2, 11 is a fine animal. My 19, 13, 7, 14, 10 is a disagreeable sound. My 12, 18, 4, 16 is a disagreeable look. with a symposium, this Fall. from 1896, email me! I'll add you to my list.